Being out on the open water is a dream which most of us have, and few of us are able to realize. One of the main reasons for this is that most of us do not live near open water and we do not have the means to transport a boat to open water (let alone afford one). Improvements in technology are about to change this. Prepare to be dazzled by the some of the best inflatable boats on the market. With an inflatable boat, you do not have to worry about transporting your craft to the water. Inflatable boats pack up so small that they can fit in the trunk of your car, while still being big enough to transport up to 6 people. They are also incredibly cost-effective, with the lower-end models coming in at under $100. Inflatable boats are great for recreational trips on a lake, fishing excursions, and even have the capacity to add a motor should you want to really get up to speed on the water. With an inflatable boat (from our list), you do not need to worry about your safety. If you take care of the boat, it will take care of you. They are as safe as regular boats and boast many of the same features. This is the best inflatable boat for a group of people who want to fish. The boat is roomy and spacious, and contains enough room to hold your fishing gear. The inflatable raft also comes with two rod holders. This craft is perfect if you want to row out to the middle of a lake and cast a few lines into the water. Talking about rowing, this watercraft comes with aluminum oars. No matter what you hit with these oars, these ones are going to hold up. The fact that they are aluminum also means that they will stand the test of time and last for a really long time. The super-tough vinyl will protect your craft from many dangers. The vinyl is able to resist abrasions and impacts. This is great for when you hit any rocks, should you traverse into shallower waters. The vinyl is also UV-resistant. The sun may beat down upon your boat, but it will not degrade the material and cause it to crack or lose color. The inflatable seat cushions have been built for comfort. The inflatable keel also means that you will stay comfortably in your inflatable seat as the boat is maneuvered through the waters. The inflatable keel gives great control and handling. This is a great boat for a relaxed day out on the lake, and you will feel more satisfied than you ever have when you cook up the fish you caught out there. 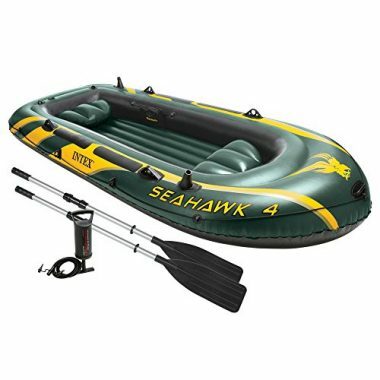 This is a top rated inflatable boat for those who wish to enjoy the open waters with a group of people. With enough capacity to fit 5 people, this is a great boat for a family or a group of friends. This is a recreational boat. The design of the boat has been considered to include the largest number of people. The downside to this is the amount of storage, but if there are five of you in the boat, you are not going to expect to have room for camping gear for five or fishing gear for five. This is an boat which you will take out on the water for some rest and relaxation. Of course, there is certainly room for some drinks and snacks, so do not think that you cannot take anything aboard. No matter where you take this vessel, you will be assured that the materials will hold up. The vinyl is tough. So tough, that the boat has been US Coast Guard approved. If they are happy with the durability of the boat, then you should be too. Another entry from Intex. They just make top rated inflatable boats. The main selling feature of this boat is that it comes with its own pump. No need to buy a pump separately or worry that the pump you have will fit. The boat is also made from their usual super-tough vinyl, ensuring that your boat will last against wear and tear, abrasions, and possible punctures. This is a boat for four people and one which comes with a variety of features. The inflatable floor is one of the most comfortable to be on and is still one of the most rigid and durable. The inflatable seats ensure that you will have a comfortable ride, and the all-around grab line will ensure your safety. 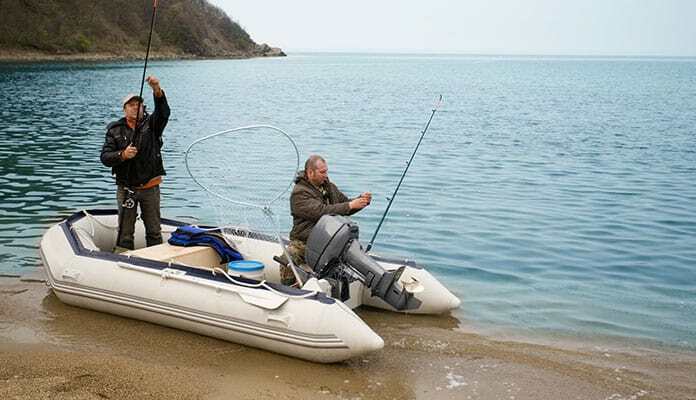 This inflatable boat is also perfect for fishing. It comes with two rod holders at the rear. There are oar holders which can hold your precious oars while you concentrate on the fish. There is a gear pouch, perfect for holding your fishing equipment. This is also an easy boat to maneuver, which makes it perfect for finding the perfect spot to catch all those fish. This sport dinghy looks like it will fly through theater like an arrow (and if you attach a motor, then it might just). A 10hp engine can be attached (which is pretty powerful for an inflatable boat), and a top speed of over 20 mph can be achieved. It really will fly through the water like an arrow. The large inflatable tubes mean that even at high speeds, this dinghy will be one of the safest you can ride in. The extra buoyancy helps to keep the dinghy steady and stable, driving it forward in a straight line and keeping everyone in their inflatable seats. This craft has a low and steady floor. This is great for two things. Firstly, when you are boarding the dinghy, it stays steady. Secondly, when you are pounding through the water at speed or turning, the low center of gravity keeps the dinghy grounded (or should that be watered?) and keeps people in the dinghy. This inflatable pontoon boat is rated for 400 pounds. It is definitely a boat for the solo traveler, but don't worry because you will be traveling in style. There is more than enough storage for everything you will want to take on your trip with you. The side storage pockets also remove to become your own gear bag. A touch which means you will not need to worry about storage to and from your inflatable craft. 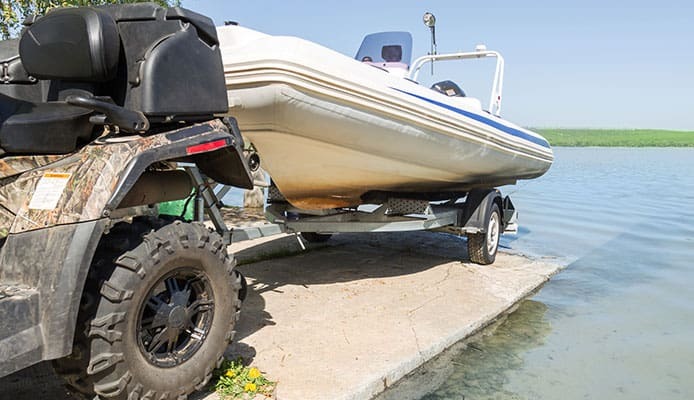 There is also a transport wheel, which means you will not have to carry your boat to and from your vehicle (provided that the ground is relatively flat). If you wish to transport yourself faster in the water, then there is a motor mount. This is a great inflatable boat for fishing from. 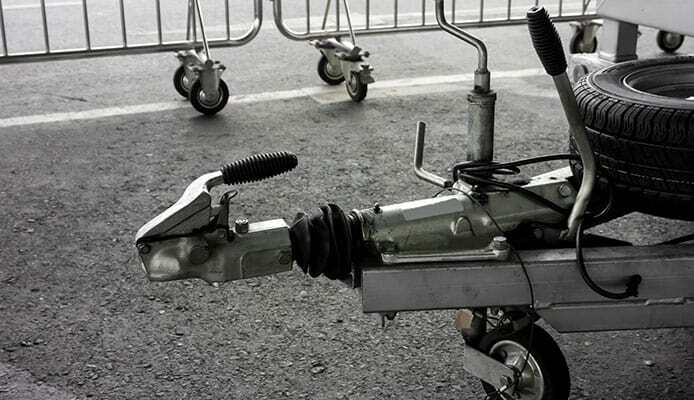 The anchoring system allows you to anchor the vessel on either side. There is also a rod holder to hold your fishing rod. The boat is also equipped with cup holders to hold your favorite beverage as you wait for those fish to bite. The Colorado XT inflatable boat is backed by two things. Firstly, the boat has a US-based customer service team. They also have one of the best warranties in the business. The peace of mind having coverage for your boat can be priceless. As a boating enthusiast, I am sure that you will take care of your boat, but if an accident does occur, you will have the coverage you need. The best inflatable boat for two people, and one which will get you to and from your destination safely. 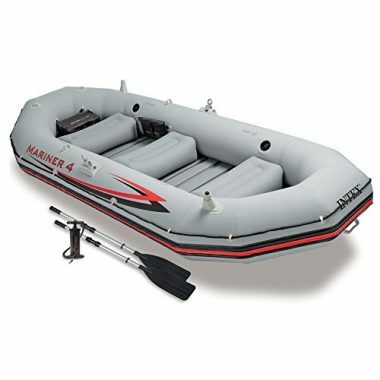 This top rated inflatable dinghy is made from premium-grade marine material. This means that you do not have to worry about even the most extreme nautical conditions (though we are not saying to take it out into the middle of the ocean or anything like that). The material will, however, protect against ultraviolet rays, petroleum, salt water, and will provide protection against abrasions and punctures from rocks. The oars, included with this inflatable raft, lock into place. How many times have you been out on the water and seen one of your floating away? Never again will you have to give chase to a rogue oar. The oarlocks keep the oars attached to the inflatable dinghy while allowing you to move them in any direction you wish. 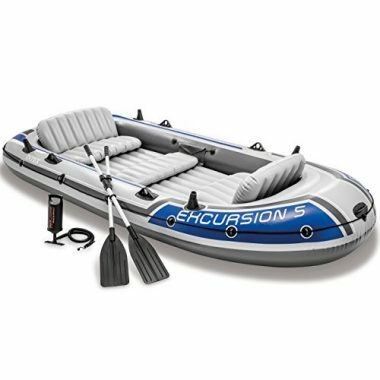 This inflatable raft also allows you to attach a motor should you wish to traverse the waters at speed. If we are talking about speed, we should also talk about how quick it is to inflate this boat. In only ten minutes, you can use the included pump and have this craft fully inflated. A great boat for two people to have a day out in, fishing or just relaxing in the midday sun. This boat looks like the kind which Navy Seals would use. This is a boat which is used by the recreational boater and the professional boater. With this in mind, it makes sense that this inflatable dinghy comes with features which professionals will appreciate. The lower part of the inflatable tubes is protected with an extra 2.4mm of heavy-duty PVC. This creates amazing protection against anything which may be abrasive or puncturing. You will really have no worries about scratches, tears, punctures, or rips in this boat. The floor is an aluminum frame with PVC fabric. This keeps you moving through the water at a faster rate than an inflatable floor would. There is also a location to add a motor mount and motor. This craft can take engines up to 25hp (wow!). If you need an inflatable raft to hunt fish, then this is the one for you. If you attach a motor and pack a couple of fishing rods, you will be coming back to shore with some monsters in no time. 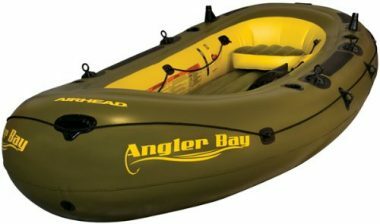 There are not many inflatable boats which can hold 6 people, but this inflatable dinghy from Angler Bay is one of them. With such carrying capacity, it comes as a surprise how light this boat is. At only 47 pounds, this the best inflatable fishing boat which packs a real punch when it comes to how much it can hold. 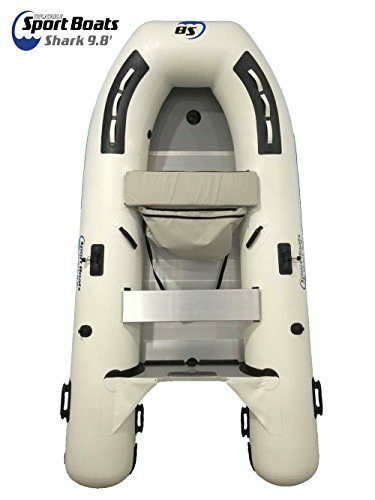 This inflatable dinghy is great for the group who want to go fishing, and it will be steady and solid enough on faster moving waters to withstand anything which comes your way. The exterior is rugged and safe; the interior is feature-packed and recreational. You will find two rod holders to hold your rods while you wait for the fish to bite. You will also find multiple molded drink holders to keep your favorite beverage safe out on the waters. There is a battery storage bag should you need to keep a better safe and dry for an electronic device. The floor is inflatable and comfortable. There is even a moveable inflatable seat. If you do want to kick it up a notch, there is a location to mount a motor. This is also a boat which is quick to inflate with the patented speed safety valves. This is a great boat for a group who wants something simple, easy to use, and safe. 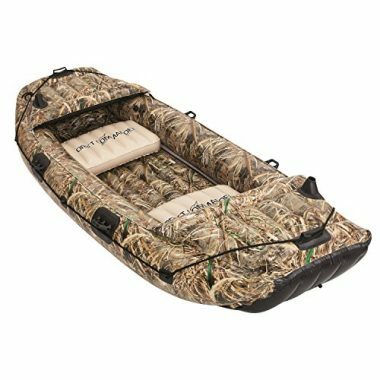 This is the best inflatable boat for hunting your next trophy in the waters. The design of the boat screams ‘hunter’. As soon as you step foot in this boat, you will feel that you are destined to hunt and catch something, anything. This boat will comfortably house two people and is also great for the solo traveler. The oarlocks help you to keep track of your oars when you are hunting for your fish, and the fact that they are attached to the boat, make it easy to quickly change direction or get moving if you are holding your rod. No need to locate your oars and get them into position. Of course, there is a fishing rod holder to help you out. The only problem you may have with this boat is that it can be too comfortable. You may be lulled into a light afternoon snooze instead of watching the tip of your rod dipping slightly as an inquisitive fish takes a nibble. If fishing relaxes you (or naps do), then this is the boat for you. Buy it for yourself, but share it with a friend when you can. Could this be the best inflatable boat? Only you can decide that, but I do know that you will feel like the king of the ocean when you are riding in this. This inflatable boat has been created by nautical engineers, and a lot of thought has gone into the design before any crafting began. The large diameter tubes are industry leading. The rear pontoons allow you to plane through the water with ease. The heat-welded seams ensure that the seams will stay together and have no chance of coming apart even after years of use in the most adverse conditions. With such a sturdy and well-built boat, it stands to reason that you will be able to attach a powerful motor. With the ability to attach 2 or 4 stroke motors, you will be able to glide through the water with the speed of a shark. I would definitely recommend this boat for those who want to ride the waves (or calm waters) at speed. This is a sport boat. It would be a waste to keep it stationary, but it is built to withstand any conditions, so if you do want to use it as a recreational vessel, then you will not be disappointed. 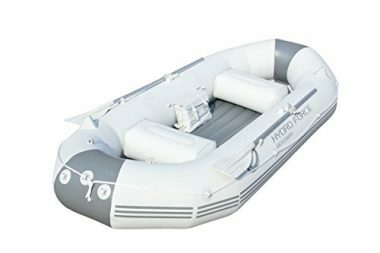 When you want to buy the best inflatable boat, you want a boat that is inflatable, but you are not going to turn your nose up at a lot of features too. So, what features should you be looking for? Most of the best inflatable boats can be modified to your exact needs, and there are a lot of accessories out there which you can use to modify your boat, but there are also a lot of boats which come with included features. If you are using your boat for relaxation, then you may want an extra-padded seat. If you are going fishing, then a rod holder will be a welcome addition. You could look for built-in paddle locks or cup holders. The options are limitless. You need your boat to be durable. Your boat is inflatable, so it does run the risk of getting a puncture, or rocks rubbing against it. You want to look for high-quality materials, such as PVC. 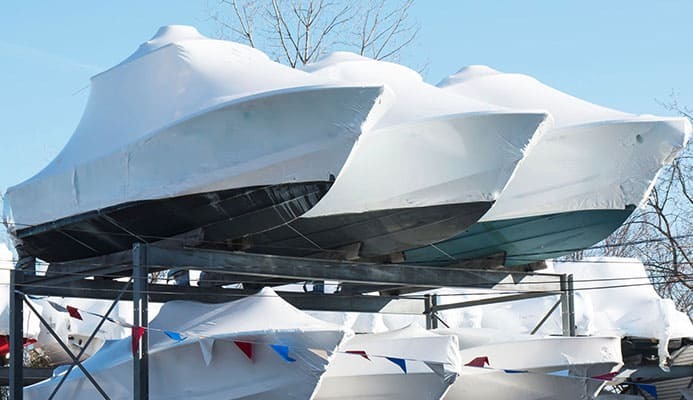 The better the materials, the more expensive your boat will be, but the longer it will last. If you can invest a little bit more, then you will not have to spend a lot on repairs. When you get to the water, you want to be able to get out on the water as quickly as you can. You should look for a boat which can be set up with one person, and one which can be inflated easily and quickly. You should also be looking for a boat which does not need any additional tools to set up. 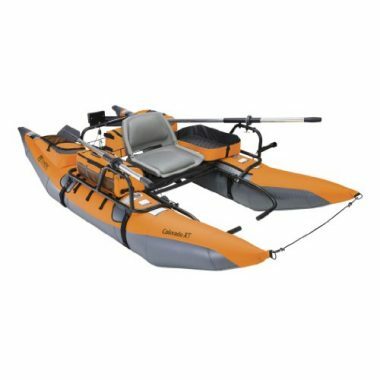 Even though you are looking for an inflatable boat, you should still expect the same comfort as a regular kayak or canoe would bring. There should be enough legroom for you to be comfortable, and the seat should support your back. You should be in a relaxed position in the boat. The value is a big part of your choice. You want an inflatable boat with all the extras and features, but you also want the boat to be affordable. Start with a budget, and then try to fit everything else into that. You may have to make some compromises, but the more features, comfort, durability, and ease of use you can find, the better. The safety and stability are important in any boat. The same is true with an inflatable boat, but, thankfully, modern technology and advances have made inflatable boats extremely safe and stable. The main thing to worry about is the PSI of the boat. If you do not inflate it to the correct PSI, then the boat can be soft and unstable. Make sure to use a pump with a pressure gauge so that you can check the PSI as you are inflating it. Inflatable boats cannot take as much weight as regular boats, but with the high-quality materials they now use, they can hold a lot more weight than you think. The key to choosing an inflatable boat is to not only consider your own weight. You should also consider the weight of any cargo you want to take with you. If you are using your inflatable boat for fishing, then you need to take into account that you will be adding a lot of extra weight. The same is true if you want to go on a camping trip. Add up your weight plus the total weight of your cargo, and then add 20% to get the capacity you should be aiming for. Our tip for when you are loading cargo into your boat is to balance the weight on both sides of the boat. Two things which you need to use your inflatable boat are a pump and some paddles. Many boats come with both, but that does not necessarily mean that you need to let that sway your decision. When the boat does come with these items, look for high-quality items. The paddles should at least be made of aluminum, and the pump should have a pressure gauge and inflate a boat quickly. The best way to ensure that your pump and paddle are high-quality is to buy them separately. Having said that, the pumps and paddles included with a boat can be good enough for your needs. What Type of Inflatable Boat is Right for You? The quick answer is, it depends on your needs. It is true that the best inflatable boats are a relatively new option on the market. When we think of inflatable boats, we often think of the small single-person dinghies which lose air quickly or take a puncture easily. With advances in technology, there are many options for those who want to purchase an inflatable dinghy. The first thing you will want to know is the number of people who are going to be using the inflatable raft. If it is only for yourself, then you will want to go for a smaller dinghy. 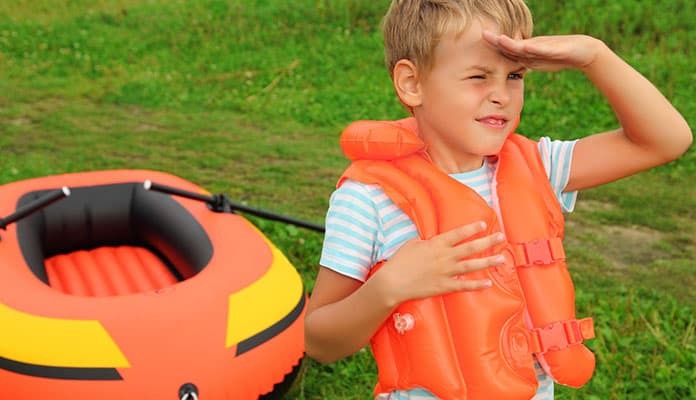 If you are part of a large family, then you may want an inflatable dinghy which is rated for 5 or 6 people (make sure to check how much weight it is rated for too). You will also want to know what you are using the inflatable raft for. If you are an avid fisher and will be using the inflatable boat to catch fish, then you will want to look into the features of various inflatable boats. Rod holders are great for fishing. If you want a craft which will get you places quickly, then you will want to make sure that you have a place to mount a motor and that the inflatable boat is rated for the environment you will be taking it into. To be honest, the choice starts with you. If you know what you are going to be using your inflatable boat for, then you have already narrowed it down. How Often Will You Use Your Inflatable Boat? I am sure that your answer is, regularly, but take the time to really think about it. Will the best inflatable dinghy be used every day? Is this a dinghy which will only be used on your summer fishing trips? Is this an inflatable boat for the kids to use on the lake? Unless you have all the money in the world, you can make a compromise between price and quality. If you are buying an inflatable boat which will be used a lot and for long periods of time, then you do not want to skimp. You want an inflatable boat which will last. It is worth investing a few more dollars to get something which will not fall apart after a few uses. On the flip-side, if you are buying a dinghy which will be used on the lake two weeks a year, then you do not need to buy something which will break the bank. Catarafts or Regular Inflatable Boats? 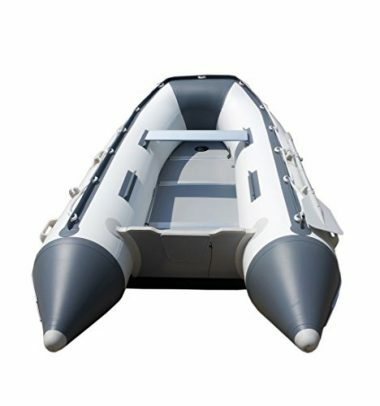 While a traditional inflatable boat features many air chambers which come together to surround an inflatable or fabric floor, a cataraft has two separate inflated tubes joined by a platform usually made of aluminum and webbing. The rower will sit on this platform, usually in an included inflatable seat. As a cataraft has less presence on the water, it is more agile and responsive than a traditional inflatable boat. Catarafts are also stronger and can bear more load. This is especially great if you want to attach a motor or have a lot of gear to transport. Due to the rigid construction, however, catarafts do not pack down as small and light as traditional inflatable boats. If you can afford to purchase a cataraft and have space and the means to transport it to the water, then it can be a great craft. 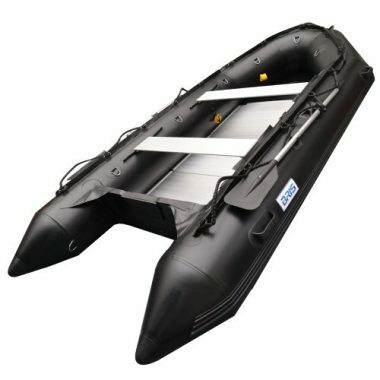 If you want something which packs down smaller and will have more space for passengers, then a traditional inflatable boat will be the way to go. 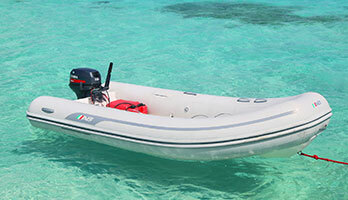 Almost all of the inflatable boats you will come across are made of PVC. PVC is a relatively cheap material and is strong and tough. If you want the best inflatable raft which is cost-effective, durable and packs down small, then PVC is the way to go. If you have the money and want to invest in a more solid and longer lasting inflatable dinghy, then Hypalon may be the way to go. Hypalon is a heavier material, but it is one which will have you coasting through the water better and will last longer. The tradeoff is, of course, the price. The other material you may come across is aluminum. If there are any rigid parts in the inflatable dinghy you are looking at, you should make sure they are aluminum. You should also choose aluminum oars when you can. Aluminum is light, durable, cheap, and will last in an aquatic environment. What is underfoot in your dinghy will also be somewhat important. They will come in two styles: inflatable and non-inflatable. If you want something which is cheaper and more comfortable, then the best inflatable raft will be for you. The tradeoffs are the threat of puncture and the added time to get the best inflatable dinghy water-ready. The second option for the best inflatable boats is a non-inflated floor. This may come as a solid fabric floor or an interlocking floor (usually aluminum). These floors are not as comfortable, but they will allow you to glide through the water more easily and they usually include self-bailing mechanisms. Q: How To Repair Inflatable Boats? Locate the hole to be patched and make sure that you dry it thoroughly. Mark the hole so that you do not lose its position should you be called away to another task. Find your PVC (after purchasing an inflatable boat, you should purchase some PVC in case of punctures unless there is an ample supply which comes with the inflatable boat). Cut your PVC so that it will cover the hole and extend two inches in each direction from it. When you are cutting your piece, you should make the piece more rounded that square to get better adhesion. Place the patch over the hole and position it so that the hole is in the center. Draw around the patch so that your dinghy is marked. Using a very fine sandpaper (180 grit), sand the PVC around the hole and inside the marking. Sand the side of the patch which will be adhered to the puncture. Clean the surfaces with a cleaner and allow to dry. In a well-ventilated area, apply adhesive to the area around the hole and the piece of PVC which will patch it. Place both surfaces together and make sure that the patch is in the correct position. Use a roller to roll over the entire area of the patch to remove air bubbles and to ensure that the adhesive covers the whole area. Allow to dry for 24 hours before inflating. Q: How Fast Do Inflatable Boats Inflate? A: This really depends on what you are using to inflate your boat. If you are using a hand pump, then it may take an extremely long time. A foot pump will be quicker than a hand pump, but an electric pump will be quickest and can have your boat inflated in a few minutes. The other thing which will affect the inflation time is the size of the best inflatable dinghy. The bigger the boat, the longer it will take to inflate. If you have a boat with a single chamber, then you can inflate it quickly and easily. The more chambers a boat has, the longest it will take. You will need to move the pump between different parts off the boat. I recommend an inflation time of 10 minutes for most inflatable boats. A: Again, this is something which depends on you. The cheapest and best inflatable dinghy can last a lifetime if you take good care of it and monitor the waters it is taken into. You can have the most expensive boat in the world, made from premium materials and have it fall apart by taking it into roaring rapids constantly. Even the best inflatable boat with decent quality will start to break up after a year if you do not take care of it well. If you treat your boat with love and care, kept it clean, keep it dry when out of the water, be sensible with it, and make repairs when needed, then you can expect your inflatable boat to last 5-10 years. Q: What Are Inflatable Boats Used For? A: Inflatable boats are used for everything that a regular boat is used for, though, you can often find that they can do more by getting to places which regular boats cannot. You can use your inflatable boat recreationally in any body of water. They are great on lakes and rivers, and even in the ocean if you stay close to the shore. If you have a big enough above ground pool, then you can even have the best inflatable boat in there. You can also use an inflatable boat for fishing, and there are some inflatable boats which are made specifically to be fished from. Look for an inflatable boat with some storage, rod holders, and a place to process your fish. You can also use an inflatable boat as part of a camping trip, or a trip into the great outdoors. If you are using your inflatable boat for a camping trip, then look for lots of storage space, for all your equipment, and a boat which can take a lot of weight. Q: Can A Motor Be Mounted To An Inflatable Boat? A: You cannot attach a motor to any inflatable boat, but there are some which are designed to be used with a motor. If you buy a boat without a motor mount, then you can seriously damage your boat by trying to attach a motor. You can also make it dangerous for anyone riding in the boat. If you do want to use your inflatable boat with a motor, then you should make sure that there is a motor mount. Even then, you should make sure that you can find a motor which is compatible with the mount, and after that, you should be prepared for the extra costs which are involved. After you have mounted your motor on the boat, you should take the time to get to know the features of your motor, and start slow when you are beginning to use the motor on your boat. Q: How Portable Is An Inflatable Boat? A: Inflatable boats are extremely portable. Most boats will come with their own bag to carry them in. When you have a bag, it will often have space for your pump, and any other accessories which you need. This means that you can get to almost anywhere with your inflatable boat. Once you are out of your vehicle, you can go anywhere you can walk to, and many places which you cannot get a regular boat to. You could even hike up a mountain and use your boat on a mountain lake. When the boat is inflated, it is also extremely portable. You may find yourself at the edge of a lake, and there could be another lake next to the one you are in. With an inflatable boat, you can get out of the water and move your boat from one lake to another. You cannot do this with a lot of regular boats, and even kayaks can need trailers to transport them. An inflatable boat is a great way to get out on the water without the costs of an actual boat. Inflatable boats have the advantage of low-price and low-volume (when deflated). With a great inflatable boat, you can go almost anywhere a regular boat can (though we do not recommend any trips out into the middle of the ocean). An inflatable boat from our list will have you out on the water in no time, and you will wonder what you did before you had an inflatable boat. Have you ever had an inflatable boat yourself or are you just considering trying one for the first time? What kind of inflatable boat do you have, if you already own one? Share your experience with the Globo Surf community in the comment section below.